Question: My horse’s digestion is normal. Does he still need digestive support? 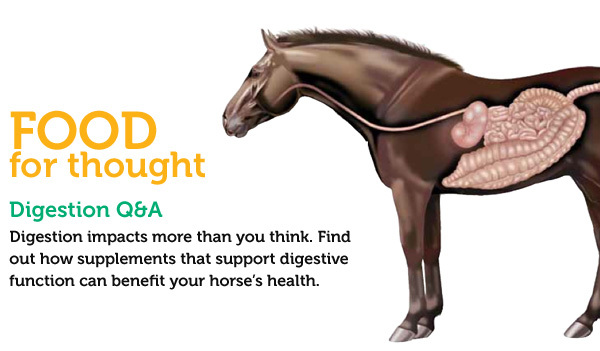 Answer: Because healthy digestion is vital to wellbeing and performance, many horses can benefit from digestive support. Stress, aging, illness, diet changes and training can all cause your horse’s digestive system to fall out of balance. This can result in minor problems like a dull coat and a grumpy attitude, or serious ones like weight loss, diarrhea, ulcers and colic. And because 65% of your horse’s immune system is in his digestive tract, poor digestive function can also mean weakened immunity. Digestive supplements can provide the help your horse needs to manage stress and fend off serious digestive problems. Question: What are Probiotics and Prebiotics? Answer: Probiotics are beneficial bacteria that live in the G.I. tract, supporting your horse’s digestive and immune function. These “good bugs” break down food, produce energy and certain vitamins, support G.I. cells, and help keep harmful bacteria from growing. Probios Powder (#15168, $16.40) contains four well- known strains of Probiotics. Prebiotics are sources of non-digestible, soluble fiber that serve as food for the beneficial bacteria, keeping them healthy. SmartDigest (#16313, $11.25) and Ultra-Elite Digest (#12206, $10.36) provide Probiotics and Prebiotics, along with Digestive Enzymes, which break down nutrients, supporting feed utilization and nutrient absorption. Question: My horse is in heavy training and trailered frequently. How can I help him maintain healthy digestion despite this stress? Answer: Consider a supplement that combines hindgut and gastric support. SmartDigest Ultra (#16312, $27.75) contains Probiotics, Prebiotics, Digestive Enzymes and Oat Beta Glucan along with stomach support from L-Glutamine and soothing herbs. The digestive conditioner SUCCEED (#12755, $83.70) supports the entire digestive tract with Yeast, L-Glutamine, Oat Beta Glucan and other specialized ingredients like Polar Lipids. Want to know more about these ingredients? Visit our online glossary at www.SmartPak.com/ingredients. Question: My horse has diarrhea. What should I do? Answer: First, be sure to contact your veterinarian regarding any case of diarrhea. Acute diarrhea should be considered an emergency. Diarrhea that lasts more than two weeks is considered chronic, and may be caused by a change in diet, intestinal parasites, sand, antibiotic usage and other disruptions to the beneficial bacteria in the gut. Supplements may help with some cases of chronic diarrhea. Since diarrhea usually results from problems in the horse’s hindgut, look for ingredients that support healthy hindgut function such as Probiotics, Prebiotics, Yeast, and Digestive Enzymes. Question: How can I change my horse’s feed without upsetting his digestive system? Answer: Feed changes (including changes in hay) can cause serious digestive disruption. Supplementing with the specific yeast strain found in Yea-Sacc (#13706, $10.40), along with Probiotics and Prebiotics, has been shown to help digestive bacteria adjust safely and smoothly, helping to avoid colic during feed transitions. Question: Is there anything I can do to avoid colic? Answer: Yes! Good management practices like dental care, a proper deworming program, making feed changes gradually and monitoring your horse’s water intake are all key. Certain supplements may also help reduce your horse’s risk. The products already mentioned on this page provide ingredients to help keep your horse’s digestive system regular and offer ideal support for any horse, every day. In addition, hindgut buffers like Equishure (#14821, $44.50) are excellent for horses that colic from starch overload caused by grain or fresh grass. To avoid impactions, encourage your horse to drink more water by feeding an Electrolyte or consider TractGard (#10089, $12.20), which provides Electrolytes, Prebiotics and Antacids. Lastly, Daily Dewormers may help prevent colic by protecting the horse’s G.I. tract from the inflammation and scarring caused by strongyles.